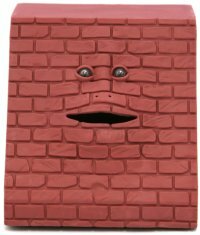 Now this is literally a money eating machine – the Face Bank Brick features a mouth where you slot coins in one by one. It isn’t exactly the fastest chomper on the face of the earth though, so you might want to get a normal piggy bank instead if you do not have the time to spare. I think this will appeal more to kids instead, since it features an animated face complete with moving eyeballs that add that creepy look. Powered by a quartet of LR03 batteries, the Face Bank Brick can be picked up for $23.68 from GeekStuff4U.